The Thompson 400 Bandsaw is a Heavy Duty Industrial High Speed Supercut Bandsaw renowned for its Unique Design. The High Quality Construction and Performance offers Superior Low Maintenance in large quality processing plants, supermarkets and buthcer shops. With the Quiet Operations and Attractive Appearance, it is ideally suited to a prominent position in shop fronts where the bandsaw is exposed to the public. The High Blade Speed and Efficient Design of the Thompson 400 Bandsaw significantly improves the cutting action. 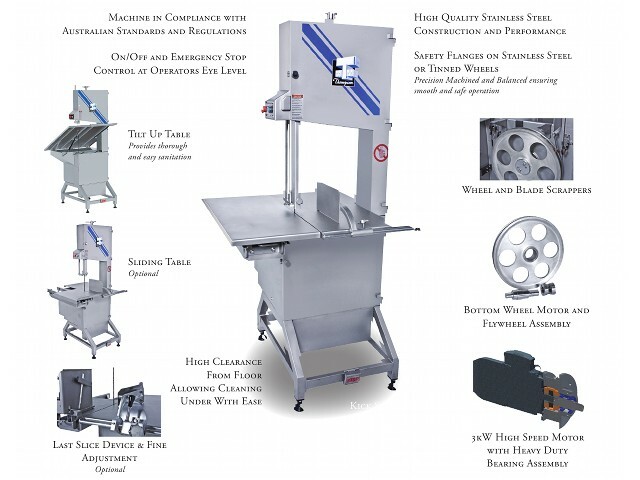 Thompson 400 Bandsaw is constructed from the Heavy Duty Stainless Steel. Wheel and Blade Scrapers are fitted to reduce product build up between the wheels and blades. The Top Wheel Housing is fully enclosed eliminating possibility of debris falling onto the table or product during operation. Bottom Wheel Motor and Flywheel Assembly fitted with coupling drive, intermediate bearing housing and lower wheel Stainless Steel taperlock. This allows easy removal of bottom wheel and adjustment to eliminate possibility of the wheel seizing onto the Stainless Steel drive shaft through the life of the machine. Fully enclosed and improved Blade Tension Assembly with positive tension setting locked to guarantee consistent blade tension through the life of the machine. Thompson 400 Bandsaw offers features that Maximize Safety to the operator and other persons in close vicinity. Work Place Safety is a priority that should not be compromised. Brake Motor allows the blade to stop within approximately 4 sec when stop button is activated. This minimizes the possibility of accidents caused through blade run on. Brake Override Button allows the flywheels to be turned by hand for easy blade setup and machine maintenance. Foot Controlled Stop Kick Switch enables the bandsaw to be stopped safely when the operator’s hands are full. Limit Switches on doors and tilt-up table ensure that bandsaw cannot be accidentally started during and after cleaning operations eliminating operator injury. Limit switches are internally wired to improve the safety, hygiene and appearance. Purpose Designed Wheels with safety flanges prevent blades from dislodging, eliminating possibility of operator injury. Precision machined and balanced wheels ensuring smooth, quiet and safe operation. Bladeguard (patented) is an automatic blade guarding system that completely covers the bandsaw blade when it’s not in use. This mechanism is fast, effective and does not reduce any cutting efficiencies. It also prevents the motor from burning out in high stop and start operation situations. Start / Stop Controls are located at easily visible eye level for quick and easy access. The Blade Tension Assembly automatically adjusts the blade to a factory preset tension. The Powerful Direct Drive System provides positive and constant blade speed and eliminates the requirements of frequent adjustments and replacement. A Powerful 3kW Motor ensures continuous smooth cutting operation through fresh or frozen products. The High Clearance from Floor allows easy and thorough cleaning providing maximum hygiene.